As Tom Petty once said, "the waiting is hardest part." After what felt like an eternity of teasers, spy shots and renderings; the Audi A1 has been officially revealed. Check out the full details, video and hi-res photo gallery of the new A1 below. – 1.6 TDI with 66 kW (90 hp) and 77 kW (105 hp) and manual transmission emit as little as 99 g of CO2 per kilometer (159.33 g/mile) (provisional value). Audi is introducing a whole new dimension to the compact class this summer. It is dynamic and high quality, emotional and individual. It condenses all of the virtues of the brand down to less than four meters – a design full of character, uncompromising quality and pioneering efficiency technologies. The agile chassis and powerful engines make the A1 the sportiest car in the segment. The young customers of the A1 live in major cities and therefore are looking for a vehicle that is designed for the urban environment. Thanks to its compact dimensions, it is very agile and nimble in city traffic and offers a high degree of everyday utility. The interior of the A1 is also sporty and of high quality. Customers can customize numerous details to tailor the car to their personal tastes. Audi’s latest model has a broad portfolio of advanced technologies on board; its infotainment system sets new standards in the segment. 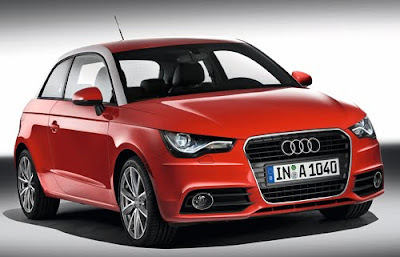 The A1 is the first premium automobile in the small compacts class – a true, fully-fledged Audi. The Audi brand stands for automotive passion. With its agile chassis and powerful engines, the A1 is the sportiest car in its class, and this is readily apparent at first glance. The design is unique and modern. Styling cues placing the A1 in the Audi family include the side line with the distinctive roof arch, the coupe-like C-pillars, the large wheel wells and, of course, the front end with the typical single-frame grille. The hood and rear hatch encompass the body; the tail lights are three-dimensionally molded and present an unmistakable design, day or night. The interior of the A1 is spacious and airy. The instrument panel is suggestive of an airplane wing; its four round air nozzles are reminiscent of the turbines of a jet. The clear ergonomics and the uncompromisingly high fit and finish typify the Audi brand’s high standards. Many lovingly designed details in the interior document the premium character of the Audi A1. In addition to the Attraction and Ambition trim lines, Audi also offers a media style package focused on infotainment and the interior design. The innovative materials and modern colors underscore the character of the A1. Whether colored air nozzles, LED interior lights or seat covers in expressive colors – customization is an important catchword. The equipment program offers countless opportunities for matching the A1 to the driver’s own personal style. There are even a variety of paint finishes from which to choose for the roof arch. Customers can order many of these features after the initial sale to follow a trend or a whim. The available infotainment and multimedia systems available come directly from the luxury class. The top of the line is MMI navigation plus, a media center that sets new standards in the compact segment. From the monitor that rises up out of the instrument panel to the control unit that follows the MMI logic, it is oriented on the systems found in Audi models in the higher segments. Based on the concert radio, the connectivity package offers the option of retrofitting an Audi map-based navigation system – a novelty in the automotive sector. The 465 watt Bose surround sound system is just one example of the complementary modules available. The sporty, agile chassis of the A1 places it at the head of its class. Whether in the city, on an interurban road or on the highway – the A1 is great fun to drive anywhere thanks to its sporty setup, the optimized weight distribution and the very direct steering. The standard ESP stabilization system with electronic axle-differential lock makes the handling of the A1 even more sporty and precise, while driving safety is increased even further. The new A1 also sets new efficiency standards. Audi is sending the new model line into the fray with four four-cylinder engines, with the two TDI and two TFSI gasoline engines producing between 63 kW (86 hp) and 90 kW (122 hp). All of the engines follow the downsizing principle – they substitute turbocharging for displacement and draw their fuel through direct injection units. All versions of the A1 impress with good fuel economy, with standard cycle values between 3.8 and 5.4 liters per 100 kilometers (43.56 - 61.90 US mpg) (provisional values). The 1.6 TDI with 66 kW (90 hp) and manual transmission emits only 99 g of CO2 per kilometer (159.33 g/mile). All of the engines are equipped with a recuperation system that allows them to recover energy during braking, and are coupled with an automatic start-stop system. A new temperature management system with switched water pump contributes to the low fuel consumption of the 1.2 TFSI. At Audi, efficiency is always high-tech. The A1 is available with the seven-speed S tronic transmission. The dual-clutch transmission changes gears extremely quickly, comfortably and without detectable interruptions in pulling power. It offers both automatic and manual modes, with paddles on the steering wheel available as an option. It provides for tremendously fun driving and also further reduces fuel consumption – typical Audi. The A1 is sporty, powerful and attractive. As a newcomer in the compact segment, it appeals to a modern customer group – a young, urban, lifestyle-oriented public. A1 customers – many of whom are expected to be women – are interested in design, music, fashion and sports. The entry-level model will be priced at around 16,000 euros.